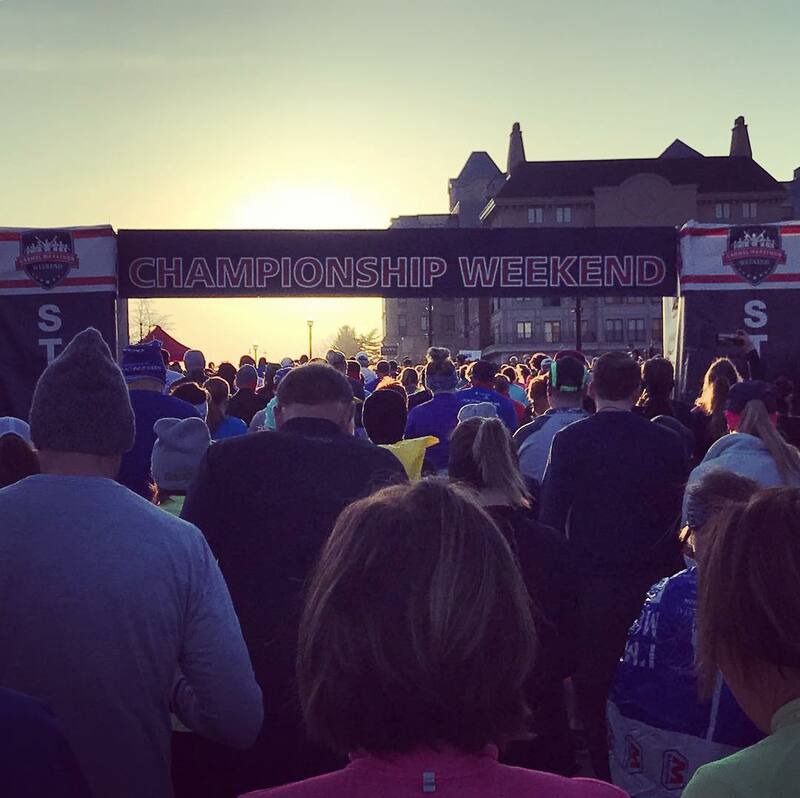 I booked a late flight getting into Indianapolis on Friday, knowing that the race would be on Saturday morning. I left NYC around 7:30pm, we landed in Indianapolis a little after 10pm, one of two flights arriving right around the same time. I picked up my rental car and drove to my friend Angela's (and her husband T.R. 's) house in the cute little historic district of Herron-Morton in Downtown Indianapolis, roughly 20 minutes away. I promptly went to bed, knowing I'd be up early the next morning at 6am for the race. Like clockwork, I was up at 6, and out the door by 6:35. 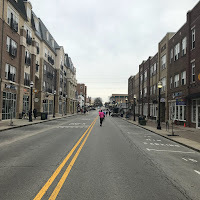 The drive was roughly half an hour north to the city of Carmel, and one of the things I noticed on my drive in once I arrived in Carmel was the fact that there were SO many roundabouts within the city center. 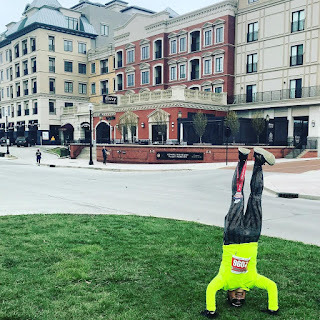 The City of Carmel is actually nationally noted for having over 100 roundabouts within its borders, with even more presently under construction or planned for the future. I was able to park in one of the parking garages in Carmel Town Center, barely a five minute walk to the start. Not long after I arrived, my Black Sheep Run friends Amy, Greg, Mitch, and Drew drove into the garage, and after handing me my bib they picked up from the expo the day before, we all walked together to the start. It was pretty cold outside - the temps were at a balmy 36º, but with the steady wind it felt below 30º. We were only a short walk away from the start area, located next to the Palladium at the Center for the Performing Arts, a beautifully designed concert hall modeled after Andrea Palladio's Villa la Rotonda in Vicenza, Italy. 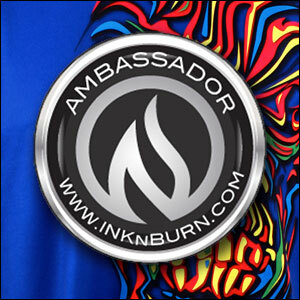 I had booked the National Anthem for the race in September of the previous year after getting connected to the race director through a mutual friend, but upon coordinating with them in the weeks prior to the race, I was informed that a daughter of one of the race sponsors wanted to sing, and given their relationship with the sponsor, they were wanting to give the role to her to sing the anthem. I offered to sing God Bless America instead, and they made room to add that in the pre-race program, getting the chance to do just that before the anthem was to be sung. After I did my thing, I jumped back into the corrals and we were off, with the beautiful Indiana sunrise in our faces. 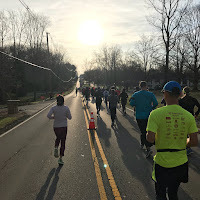 I crossed the start mat just after 8am and began a labored and somewhat slow run, as we turned right off of City Center Drive, heading south along Rangeline Road. We made our way past a couple roundabouts as the road became Westfield Boulevard after 116th Street, continuing our straight shot southward as a mix of commercial and residential surroundings gave way to an almost exclusively residential area near Woodland Country Club. 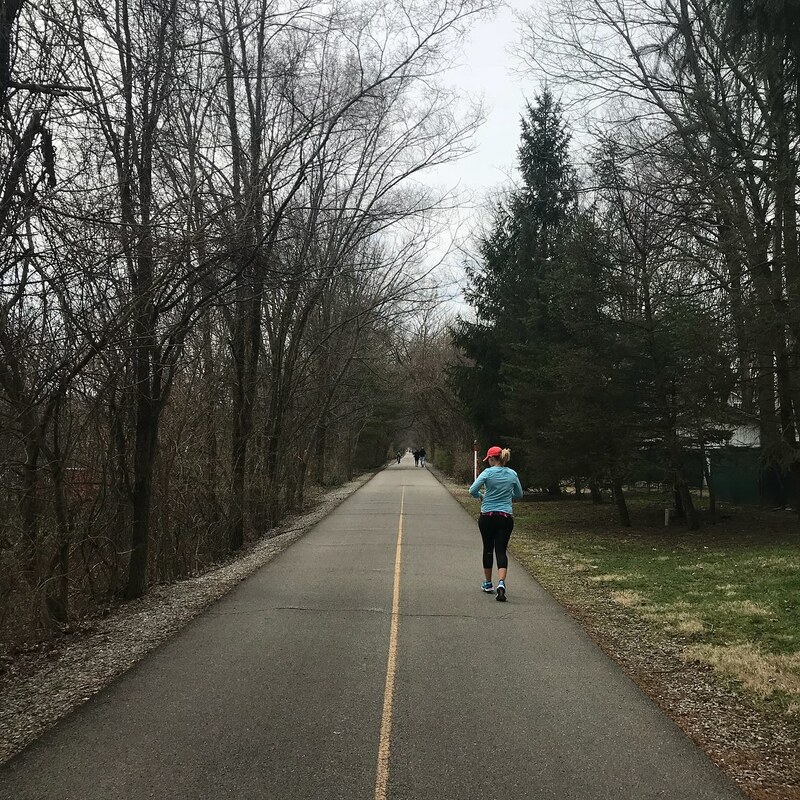 As had been common for the last few weeks, my first six miles were a barrage of pain. Probably needing to get used to the cold (and likely still a little sore from the previous week), I ended up walking quite a bit, with pain and tense muscles along my calves and ankles. A little after the two mile mark, we turned left onto 106th Avenue. 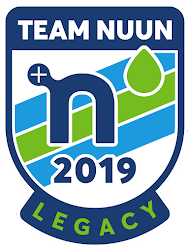 I knew I was in for a slow race, because my 9:55 first mile gave way to a 12 minute second mile, and would never dip below an 11 minute pace for the remainder of the marathon. At around mile 3 on the pastoral 106th Avenue, I found my friend Joan from Rhode Island, and we decided to run together and catch up for the next 4-5 miles. Suddenly, out of nowhere, a herd of deer charged past the runners, crossing 106th Avenue, and thankfully not taking out any runners who were trying to get by. Eventually, we found our way to Hazel Dell Parkway, a meandering road, heading northward for two miles past more residential subdivisions. While running with Joan, I found another friend, Carol from Arkansas, who I got to run with for a bit, as well. 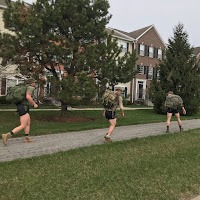 As we continued along the route, a group of guys (who I assume were military) were running together with rucksacks, and braving the cold weather while wearing SHORTS! 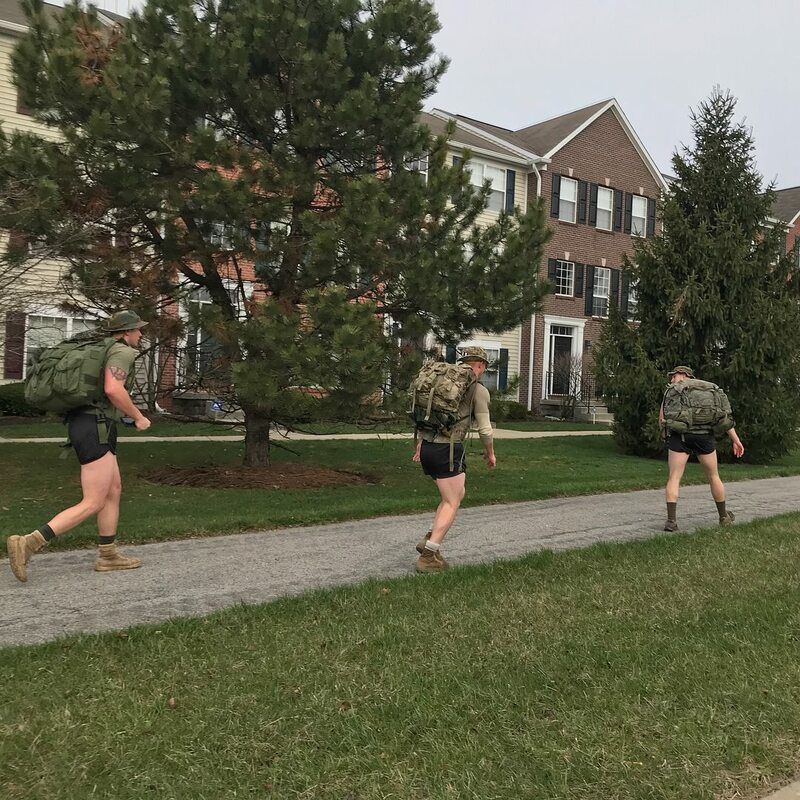 Just before the 7 mile mark, we made a left turn into one of the residential subdivisions, with sections of main road peppered in between. 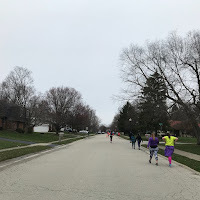 We ran a small segment onto 126th Street, and passing a local middle school, before returning through a curvy residential street called Limberlost Drive, coming back out onto Main Street, then turning right onto Hawthorne Drive, as we made our way to Smokey Row Road, and eventually the football stadium for Carmel High School. All the while, we passed by homes where the mailboxes out in front were all uniform, with the full address written in the same uniform font (something like the Monotype Corsiva font seen in Microsoft Word) on the side of the box. We also dealt with a huge amount of concrete, rather than asphalt roads, which unfortunately made it a lot harder on my knees and joints, and I was definitely feeling it. I knew I was having a rough time when 5:45 pacers Ed and Bonnie passed me around mile 8 with a large group of folks. 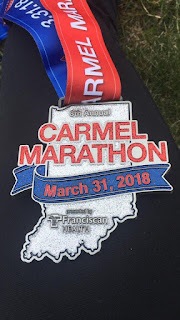 We found our way onto the first of several paved trails that the marathoners would be running on, the Greyhound Trail, as we passed by Carmel Stadium. 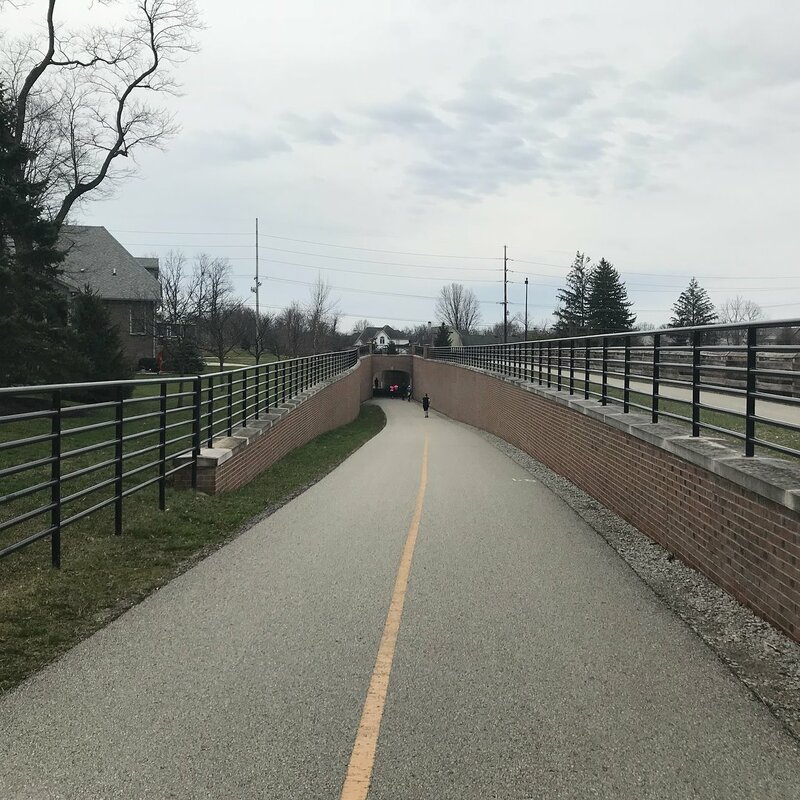 At about the 11.3 mile mark, the trail merged with the Hagan-Burke Trail, then turned onto the Monon Greenway, which eventually found its way out to 2nd Avenue NW in downtown Carmel. The fastest marathoners, who are just about the finish their race (a whole half marathon ahead of me!) begin to pass me on the greenway, including the first female finisher. Knowing full well I'd be retracing these steps in about thirteen miles, we took a turn onto Main Street, then back onto Rangeline Drive and smack dab into the middle of the Carmel Arts & Design District. We heard the sound system grow louder as we continued our way south, then passed through the halfway point onto City Center Drive alongside finishing half marathoners (and marathoners finishing well under 3 hours.) Hungrily, I yell out to passersby how much I wanted a donut. I clocked in a SLOW 2:51 first half, one of the slowest I've done for a fairly flat race. However, now with my legs feeling a bit better... "warmed up" you could say... 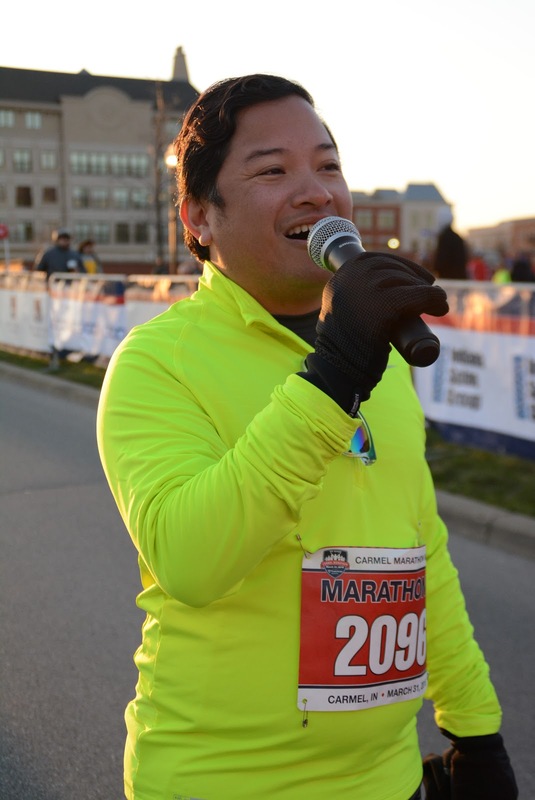 I start to catch a second wind as we make our way through the second half of the race. There's something in the back of my head that makes me think I have a good chance of doing a negative split with this second half. This dog had faith in me that I could negative split my second half. We made our way around the Palladium, and eventually, I end up catching right back up to Ed and Bonnie with their group of runners who had passed me about five miles earlier. Now on the Monon Greenway, it's much more quiet, especially with the fewer amount of runners taking on the second half of the race around me. I find a sense of calm as we take on this fairly flat section of course, posting some of my faster miles (as the pain in my legs began to go away), and begin to take more notice of my surroundings; I realize that a couple red cardinal birds are flying amongst the trees on this peaceful segment of the Monon. Truly a peaceful and beautiful part of this race! We run on the Monon Greenway, a popular trail that serves walkers, joggers, runners, bicyclists, rollerbladers and nature enthusiasts alike on the former Monon Railroad, for roughly three miles of the 5.2 mile portion that Carmel maintains within its borders. My mile 16 split was an 11:19, which I'd realize later would be my second fastest mile of the race other than my opening mile. 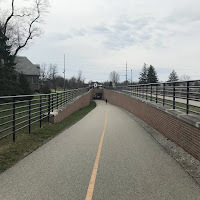 We turn right onto 96th Street (the southernmost section of the greenway), then run toward College Avenue, where we turn right and then follow Pennsylvania Parkway into a very business park like area. Still into this second wind, I continue to pass some slower runners making up valuable time. I really wanted a donut. 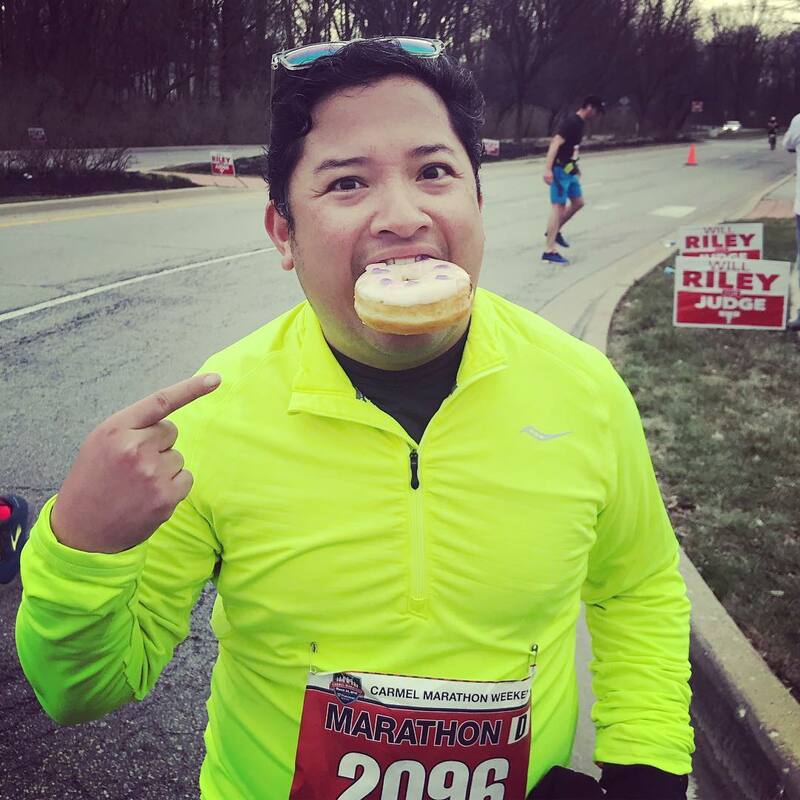 At mile 18, as we pass by the business park, I notice volunteers at the aid station with a box of Dunkin Donuts, so I kindly ask if I could have one... I end up running with one in my mouth for the next half mile. God, that donut was good... I could've used it 6 miles ago! We continue northward along the largely soulless Pennsylvania Street, past lowrise commercial on our left (abutting the highway) and non-distinct single family homes on the right, then turn left onto 111th Street, going over the highway (US 31.) We eventually curve around to Illinois Street, passing near big construction projects. This section of the course is incredibly boring. 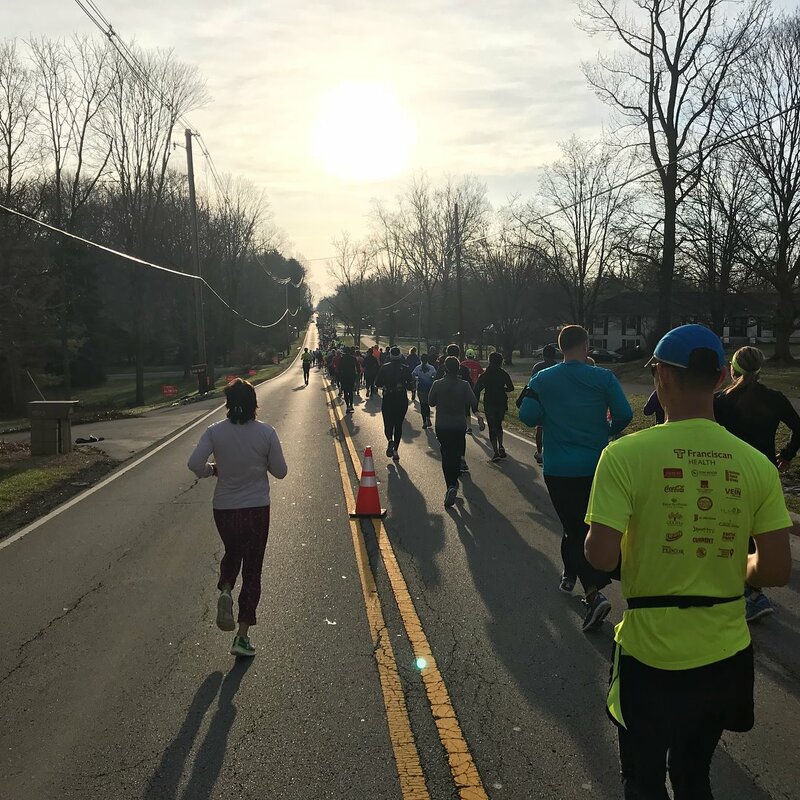 As we see the Indianapolis Mormon temple in the distance, we continue our way northward, then pass through a short out and back section (perhaps just to add a fraction of a mile? ), with a food truck at the end of the road, being used as the turnaround marker. However, NO FOOD. 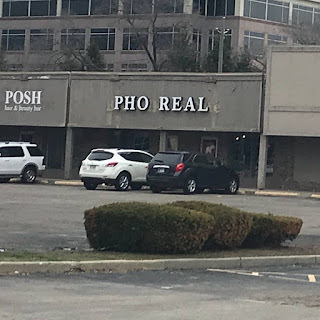 Maybe they had some earlier? Who knows. Now something like 19.5 miles into the race, I just want this thing to be over. Back on the Greenway for the last bit! The largely empty Illinois Street heads northward as we pass IU Health North Hospital. At mile 20, it started to rain, which we had to deal with for roughly the next two miles. 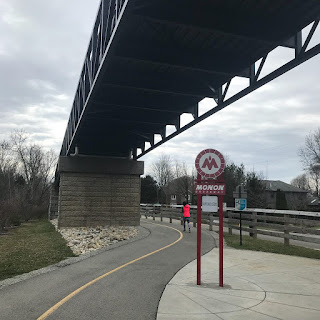 We returned to residential areas between the 22 and 23 mile marks along Oak Ridge Road up to Nevelle Lane, where we turned right, then took an out and back along Rohrer Road with the Monon Greenway visible to our right. At the end of the turn around, it was so cruel to see a ramp upwards getting ourselves back up to the greenway. 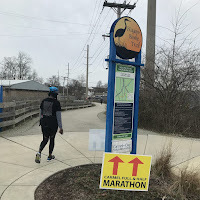 We ran along the greenway, and eventually found ourselves back on the familiar route that we saw from mile 12 to the halfway point -- this time, I was finally getting myself to the finish line. Along the short out and back section near the turnaround, I saw Ed and Bonnie roughly a mile behind me, so by then I knew I could still hit a 5:35 or so for my finish. By the time we got back onto Rangeline Road, the wind had picked up significantly. 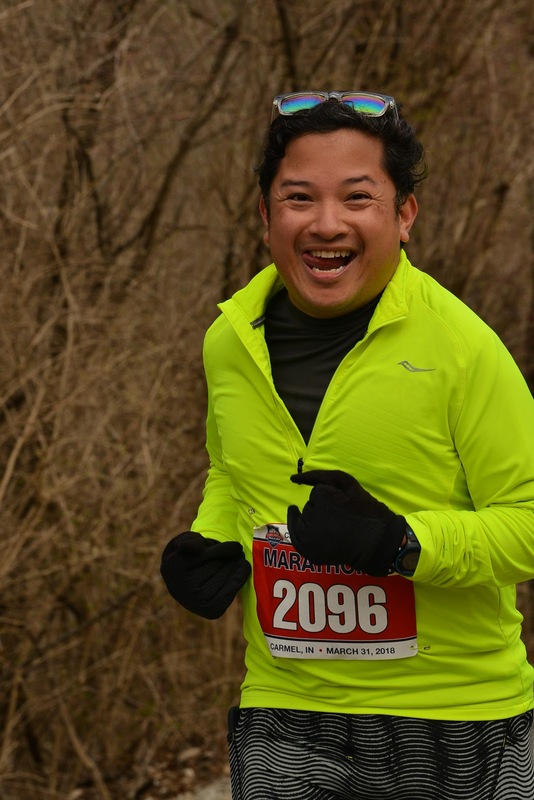 While I knew they were providing a challenge to runners to take on a 1/2 mile "sprint to the finish," I knew it wasn't going to happen for me the way this headwind was pushing back on me. I eventually crossed the finish line in a highly respectable 5:34; I joked that knew I wanted to look like Beyoncé when I finished, but I didn't mean this... not with sand in my mouth! 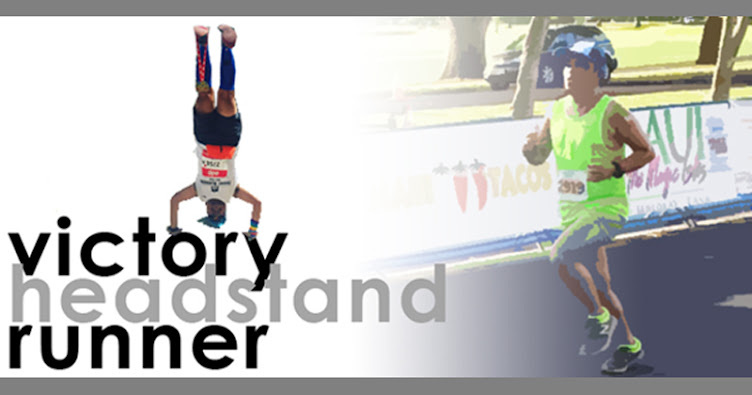 And I definitely could foretell that the second wind was a thing for me this race, as I did record a negative split: 2:51 for the first half, and 2:43 for the second half! 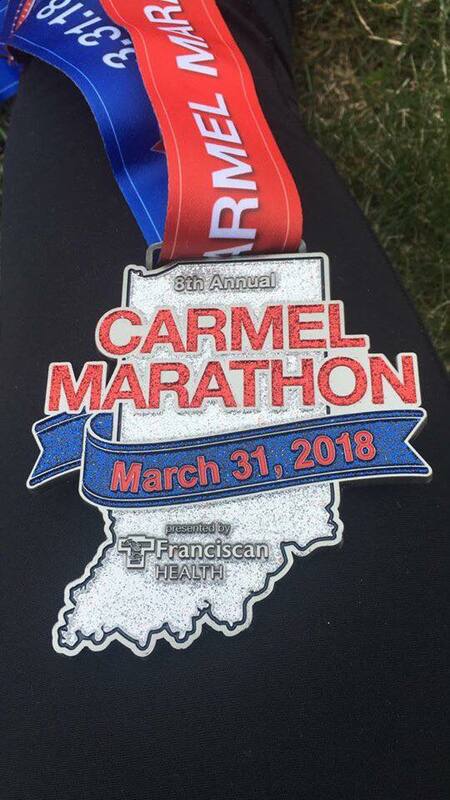 I gladly received my medal for the race, in the shape of the state - a medal design I covet whenever I do races in new states! 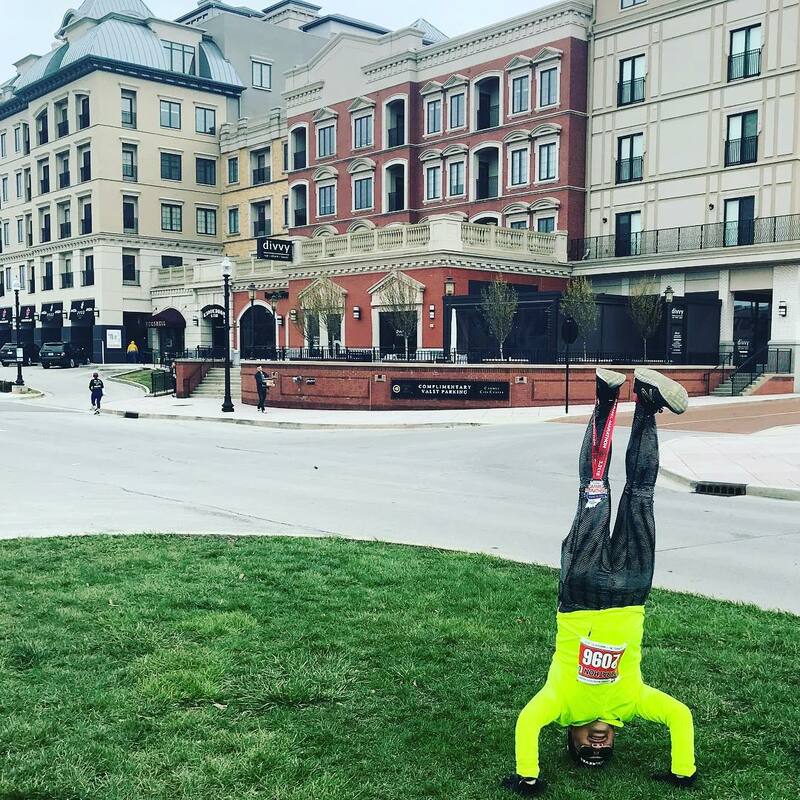 Feeling super cold, I hurried myself along, getting someone to take my customary headstand photo with my background as the Carmel City Center's distinctive architecture, reminiscent of the Georgian style like the nearby Palladium. I drove back to Indianapolis ready to warm up as much as possible with my rental car's heater, before a much needed shower. 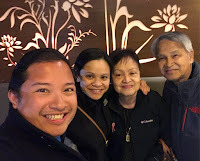 Later that night, I met up with a family friend (my mom's medical school classmate) for dinner with family friends at The Journey, an eclectic sushi, prime rib, and seafood buffet northeast of the city. That same evening, I was checking the scores to the Michigan/Loyola Chicago Final Four basketball game, as the winner would punch their ticket to the NCAA Basketball Championships, which my alma mater (Michigan) won! 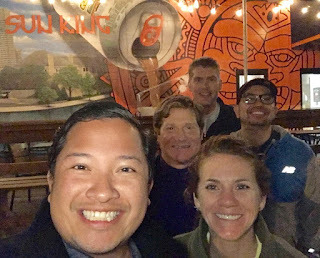 To celebrate, I joined a couple my Black Sheep Run friends for some local brews at Sun King Brewery. Afterward, I returned back to Angela and T.R. 's to watch the KU/Villanova game to determine Michigan's opponent for the title. After watching KU sadly lose to Villanova, we set up a fun Easter "display" in the kitchen for Angela and T.R. 's young son Lucas to enjoy when he woke up the next morning. Sun King Brewery with Black Sheep friends! 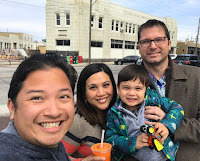 Sunday was Easter morning, and I joined Angela, T.R., and Lucas, to have brunch at Mesh, a contemporary American restaurant on Massachusetts Avenue in bustling downtown Indianapolis. 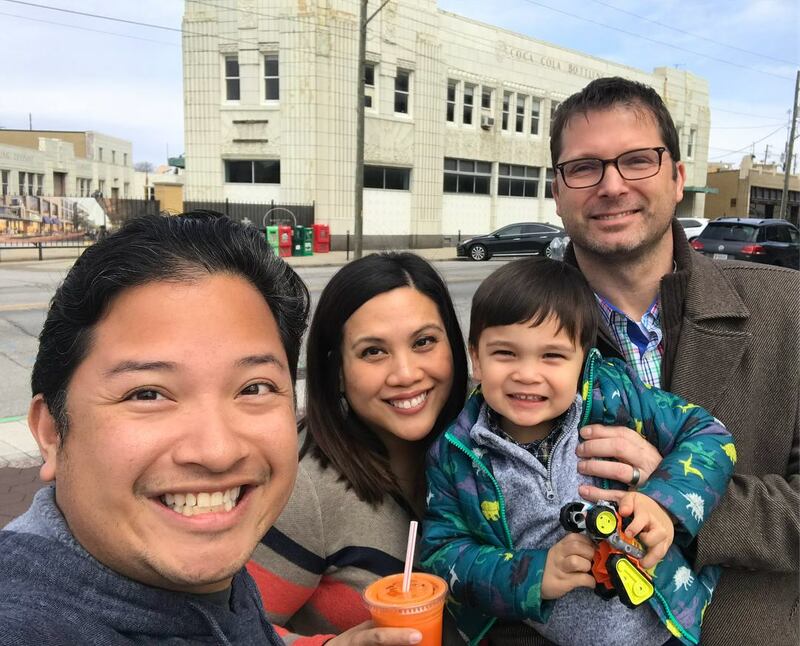 After the delicious meal, we decided to walk around on the avenue, to admire the major developments happening in this area, known as the Bottleworks District. Slated to open in Spring 2020, the $300 million project that sprawls over 12 acres in the north end of Massachusetts Avenue, is anchored by the nearly 100 year old Coca-Cola Bottling Company factory building, an art-deco style landmark being repurposed into a center for commerce, history, and arts. Also planned for the area are 180,000 square feet of office space, 175,000 square feet of street retail, a 30,000 square foot food hall, upwards of 240 condos and apartments, a 150 key hotel, and an entertainment complex featuring a dine-in movie theatre. One of the boutique stores that has been in the area for awhile, which we popped into, was Homespun: Modern Handmade, a fun boutique, gallery and workshop space devoted to contemporary handmade goods and all things Indianapolis. With my flight later on that evening, and my friends having plans with T.R. 's family, I set off on my own for the rest of the afternoon, hitting up another local brewery. 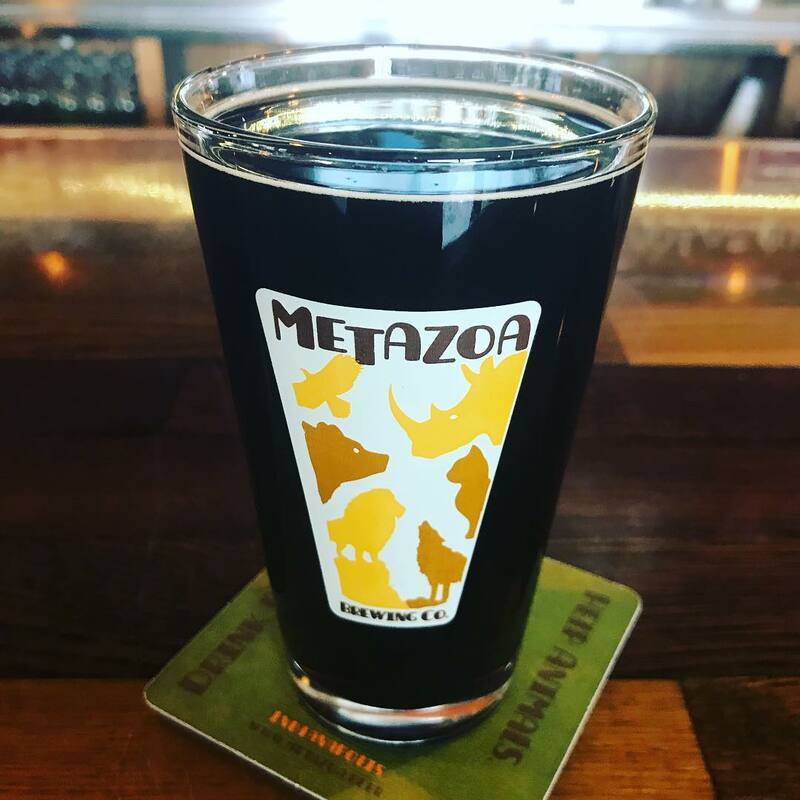 It became one of the highlights of my quick weekend trip, visiting Metazoa Brewing Company. 5% of their profits are donated to animal and wildlife organizations, and they seemed to specialize in stouts, my favorite beer! 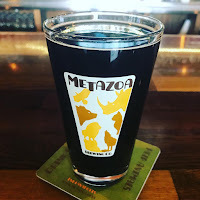 Among the ones featured in the menu were "Kitten Slumber Party," a Chocolate Milk Stout; "Puppy Slumber Party," a Chocolate Peanut Butter Milk Stout; "Irish Setter," a Dry Irish Stout; "Black Chai Affair," a Chai Oatmeal Stout; and "Chocolate Charlie Imperial Stout," a Chocolate Cherry Imperial Stout. 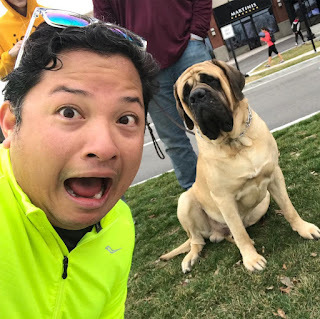 And fittingly, as I was there, the place got more and more crowded with beer enthusiasts and their pet dogs... in fact, at one point there seemed to be more dogs than humans in the brewery! The place definitely became a spot to hit up the next time I would be in town. After I had my fill, I headed to the airport for my quick flight home, and my Indianapolis/Carmel weekend came to an end!